But, perhaps you have, on at least a few occasions, said to yourself, “That isn’t right and I’m not going to let you get away with it.” Then, within seconds, that tight arm and tentative play you were just grimacing over, is gone. It is replaced with a surge of adrenaline and intensity. Intensity that turns into decisiveness, a sense of intention. You take control over your game. You upgrade your sense of determination and you are authoritative with your shots. You end up winning the game and the match. What just happened? Well, for one you went from a tentative mode–one of threat–to a “challenge” mode as Po Bronson calls it in his book, Top Dog. Any risk aversion you were experiencing (not wanting to make errors) was replaced with a productive, assertive and decisive mindset. And the physiology followed. Of course, too much anger would cause you to become reckless, not fearless. 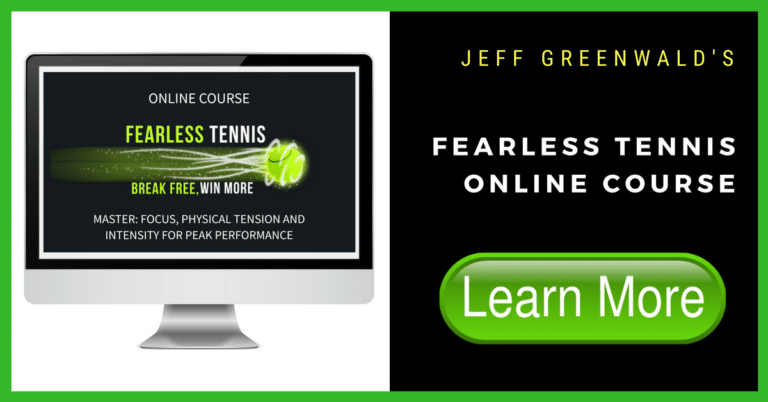 The key is that it’s channeled into the next shot and your intensity rises just enough to shift your attention and take control of the situation. Anger can be a great fuel for productive action. Many people think that anger is always negative. When it’s directed at a target (not a person) and you have the ability to execute or solve the problem it can become a powerful contributor to peak performance. Next time you need to find a little more pep in your game try to conjure up some irritation and channel it appropriately into your shots. Perhaps this is just one of many techniques that could help you get closer to your best state and turn a negative situation into a productive one.